Our real time black swan – the Icelandic Volcano ! 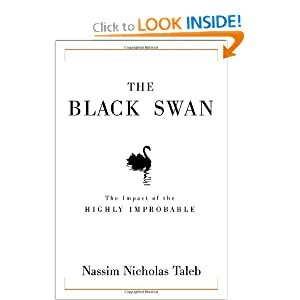 As an avid admirer of Nassim Nicholas Taleb’s unputdownable book “The Black Swan – The Impact of the Highly Improbable“, I have since become in awe of the power of nature, chance and random events to shape our lives, much more than we think we can direct and plan them ourselves. “Before the discovery of Australia, people in the Old World were convinced that all swans were white, an unassailable belief as it seemed completely confirmed by empircal evidence. The sighting of the first black swan might have been an interesting surprise for a few ornithologiests (and others extremely concerned with the coloring of birds), but that is not where the significance of the story lies. It illustrates a severe limitation to our learning from observations or experience and the fragility of our knowledge. One single observation can invalidate a general statement derived from millennia of confirmatory sightings of millions of white swans. All you need is one single (and, I am told, quite ugly) black bird“. Meet the Black Swan . . . So back to Iceland. The point is that no one in the airline industry seems to have taken seriously the possibility of a – once in 200 or less years – volcanic eruption wiping out their business, because they couldn’t fly – in sky polluted with volcanic ash. Enter the icelandic volcano . . . This – the bankrupting of large sections of the airline industry – is now starting to look possible and already there is talk about a bailout for airlines along the lines of the banking sector. To which taxpayers are most likely to take a very dim view to say the least . . .
To face this challenge, what we are talking about here is pricing in the concept of inter-generational risk – i.e. over more than 50 years and more – which I fear, only the scientific conquest of death might work to assuage. And only then 50 years hence, not now. In our launch essay for the Platform section of the EPC website, prostate Angus Hanton argues that the government has used too high a discount rate for unfunded public sector pension liabilities – now at 5.5% compared to 3-4% in some other countries. This means that when those UK public sector pensions become due, sickness the unforseen liability could be as much as £1 trillion pounds. Angus is an entrepreneurial business economist. He has three online enterprises in buying and selling woodland www.woodlands.co.uk trading domain names with www.giraffe.co.uk and home storage, malady see www.storage.co.uk. The government’s calculation of the national debt is about £900 billion, projected to grow by more than 50% over the next 5 years or so to about £1.4 trillion. It is those figures that are worrying the international financial markets. This debt is owed mainly in the form of government bonds but the government also has some other very significant commitments. The largest of these is its commitment to pay pensions. This includes: state pensions payable to most citizens; pensions for civil servants; and pensions for workers in state bodies of which the NHS is the largest. These government pension liabilities are not matched by accumulated pension funds. This contrasts with the private sector where both employers and employees pay pension contributions. These payments build up a fund out of which future pensions are paid. Companies in the private sector are required to have independent consultant actuaries to assess the adequacy of these funds to meet future liabilities. Pension obligations are government commitments but are not included in the government’s calculation of its indebtedness. The size of these commitments can be worked out by estimating the future payments and then calculating the present value of these future payments. This process of taking a future liability or asset and working out its value today is known as “discounting”, on the basis that money held now is worth more than money to be received in the future, and similarly future commitments are assumed to have a lower value than present ones. The central question in calculating the present value of future assets and liabilities is what discount rate to use. This is sometimes called the “social discount rate”. To put the scale of this into perspective, we know that the Government Actuary’s Department estimates the present value of these unfunded pension liabilities at about £2.2 trillion, so even in the context of the official government debt the numbers are very large. Of this figure, £1.4 trillion relates to the state pension and £800 billion to pension commitments for government and other public sector employees. To get to these figures the Actuary’s Department uses estimates of life expectancies and then takes the sums which are expected to be paid and discounts these back to their present values using a discount rate. It uses a discount rate of inflation plus 3.5% per annum. This discount rate is used fairly consistently throughout the UK government and is set out in the Treasury’s “Green Book”1. It is therefore worth looking a little at how this inflation plus 3.5% figure is arrived at. The basic idea is that 3.5% is made up principally of two elements – the social time preference for having benefits sooner rather than later, which is put at 1.5%, added to the rate of per capita growth in the economy. This growth rate is put at 2%, based on a past real growth of 2.1% per annum in the period 1950 to 1998. It is very much open to question whether this extra 2% should be used in discounting pension liabilities but presumably the argument is that as the country’s wealth increases the liability becomes progressively easier to afford. This is additional to adjustments for inflation. The pensions liabilities are generally index-linked so higher inflation will not reduce the liability. Many economists believe that the appropriate discount rate should be the risk-free real interest rate, which should be equivalent to the government’s cost of borrowing. Using UK index-linked interest rates2 to show the government’s real cost borrowing suggests they should be using a rate of under 1% (plus inflation). This demonstrates that a rate of 3.5% (plus inflation) is significantly too high. One argument that has been advanced for keeping the discount rate so high is that borrowing rates are artificially low at the moment, but it is hard to sustain this argument unless the government knows something that the markets don’t. At a quick glance these rates – 3.5% over inflation or 1% over inflation –may look fairly similar but in fact the impact of choosing one rate rather than the other on the present value of pension liabilities is extremely large. Let’s assume, for the sake of simplicity, that the average pension liability is payable in 25 years, and that current inflation is 2%. In that case we should in fact be discounting the liability by 1% over current inflation (being 3% in total) rather than the government’s rate of 3.5% plus inflation (being 5.5% in total). Using these lower discount rates, derived from the government’s cost of borrowing, the unfunded pension liability is very much larger at about £4 trillion rather than £2.2 trillion. Even if one gives the government some benefit of the doubt and takes a discount rate as high as 2% over inflation the pension liability still amounts to £3.1 trillion which is almost a trillion pounds more than current estimates. This equates to an extra liability, expressed in today’s money, of £40,000 per family in the UK. The government in the Treasury “Green Book” accepts that lower discount rates should be used for very long term liabilities such as climate change because, it is argued, unless a lower rate is used future generations’ interests will be unduly discounted and their interests virtually ignored. The Green Book sets out a (rather arbitrary) table of lower discounts for longer term liabilities so that, for example, after 30 years the rate excluding inflation reduces to 3% and make progressive reductions for longer periods, so that for liabilities (and assets) which are 300 years away a discount rate of only 1% is advocated. The government certainly wants climate change measures to make sense so in order to justify them in economic terms it uses lower discount rates for assessing much longer term costs (and benefits) suggesting that even some in government have doubts about the discount rates they use. How did the government get into the position of using such a high discount rate for pension liabilities? Maybe there is a problem here of vested interest – it suits the current government to have its liabilities understated by the use of a high discount rate. Also, the conceptual difficulties in this area make it one where most non-economists fear to tread. Until fairly recently it was perhaps arguable that the real risk free return on assets was as high as 3.5% and that economic growth might justify such a high discount rate, but it is much harder to argue for this when growth has dropped and drivers for future growth are hard to find. What do other people think the discount rate should be? A survey3 for the Asian Development Bank of different countries in 2007 shows that there is considerable variety in what discount rates are employed around the world. However, the US uses, for its calculations, the interest rate on treasury debt which has a maturity comparable to the maturity of the liabilities. Where they choose a fixed figure it is between 0.5 and 3% but in any case they do a sensitivity analysis (ie they work out what their liabilities would be based on different discount rates). In an important 1993 OECD paper4 economists warned of the increasing risks posed by “pay as you go” (ie unfunded) pension schemes. Their calculations were based on discount rates in the range of 3% to 4%. This compares to a discount rate now being used in the UK of 5.5%. In summary, the government is using a discount rate that is significantly too high. It is using that rate for a very large liability where much of the liability will become due many years ahead with the result that its pension commitments are being underestimated by about a trillion pounds. whether state and public sector pension commitments need to be reviewed – even if this requires retrospective changes to entitlements. To which of course, my answer was an emphatic no. The money is just not there. And no one in the audience seemed to register even a flicker of disagreement. A real shame then that none of this politicians are giving it a mention during the general election, less still the leaders TV debate last night. However where I respectfully disagreed with my fellow panellsts and some in the audience was on the security of future UK gas supplies and the implication of the non-delivery of renewables targets around the middle of the next decade when the energy gap is forecast to kick in. It seems to me fairly obvious that the coal fired power stations due to close down in 2015 thanks to the EU’s Large Combustion Plant Directive will have to remain open for a few more years until cleaner plant becomes available and the 2020 target will have to be renegotiated. However some of those in the gas industry would disagree. Their view is that because plenty of CCGT and LNG terminal capacity is being installed, the gas will be also there. But I would have much more confidence in their rosy predictions if I didn’t know that the UK will have to compete in the spot market for LNG cargoes, which last year were 87% sewn up in long-term supply contracts and destined mostly for the Pacific Basin. Thanks to the West’s recession, US shale gas discoveries and a consequent LNG supply surge, there’s no denying that there is a global gas glut at the moment. Yet as it is not yet a truly fungible commodity, it’s a very long way from solving local and pricey shortages which the UK is overexposed to. We are still at the wrong end of European gas pipelines, a long way from the LNG target market of the Pacific Basin and demand is going to rise, not fall, especially with a population destined to reach 70m by 2030. That’s why I fear, due to our own mismanagement, the UK’s power supply just might be at the mercy of external events over which we have little control from 2015/16.